Physics 235, Homework Set 10. 1. Show that none of the principal moments of inertia can exceed the sum of the other two. 2. A uniform rod of length b stands vertically upright on a rough floor and then tips over. What is the rod's angular velocity when it hits the floor? (a) from the midpoint of one side. 4. A physical or compound pendulum is a rigid body that oscillates due to its own weight about a horizontal axis that does not pass through the center of mass of the body (see Figure). 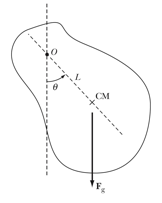 Assume the pendulum of mass M is released from rest from an angle q0. Determine the angular velocity w as function of the angle q. Note: do not assume that the angles are small. This set covers the material discussed in Chapter 11.